On Thursday, September 13, Argentina witnessed the largest protest to date under the administration of incumbent president Cristina Fernández de Kirchner. Reminiscent of the “cacerolazos,” the demonstrators who famously protested with pots and pans against the 2001-2002 collapse of the Argentine financial sector, thousands of Argentines gathered in the main plazas and intersections of cities across the country including Buenos Aires, Rosario, Córdoba, and Mar del Plata. Images from the manifestations have revealed Argentines chanting, holding anti-government signs, and banging kitchen pans. Using social media like Facebook and Twitter to mobilize, demonstrators gathered in front of the presidential residence in the northern Greater Buenos Aires region of Olivos while others marched along the major avenues of the capital to gather in the Plaza de Mayo. Since her 2011 reelection, in which she won 54 percent of the vote, President Fernández de Kirchner has steadily lost support among Argentine citizens, mainly due to feelings of both economic and personal insecurity. According to the Argentine newspaper Clarín, signs held by protesters addressed a myriad of the population’s major concerns: “Cristina, give back the country. We don’t fear you,” “Stop the inflation,” “No to constitutional reform. No to the re-reelection,” “We want freedom to use our savings,” “Security,” and “No to the reduction of our liberties”. These signs are the latest exemplifications of an abrupt, if not unexpected, loss of support for the once-popular president. Much of the unrest seems to stem from recent economic legislation enacted by the national government in an attempt to stop the flow of United States dollars out of the country. These new measures have made it nearly impossible for Argentines to obtain U.S. dollars legally, giving rise to a parallel black market specializing in currency trade. With yearly inflation estimated at an alarming 25% by the Economist (about twice the value reported by the Argentine government) many middle and upper-class citizens have relied upon saving their earnings in more stable currencies, mainly in U.S. dollars. Originally, the government implemented such restrictions to curb this practice in hopes of strengthening the Argentine peso, but in doing so it has angered a sizable portion of the population. Due in large part to the release of controversial and likely fabricated economic statistics by the National Institute of Statistics and Censuses of Argentina (INDEC), citizens have lost confidence in the transparency of their government’s claims. Since 2007, INDEC has struggled to maintain credibility after glaringly underestimating the country’s inflation rate and the subsequent cost of living. For example, INDEC recently announced that a family of four can be considered above the poverty line if it spends more than 688 pesos per month on food, or approximately six pesos per person per day. However, a study by the University of Buenos Aires established the minimum daily budget as 24 pesos per person for a healthy diet, four times INDEC’s estimation. To give a bit of perspective, the Economist has pointed out that six pesos, the equivalent of approximately $1.30 USD at the official exchange rate and only around $1 USD on the black market, is barely enough to buy an alfajor, a typical Argentine cookie eaten as a snack or dessert. Because of the government’s insufficient funding for improvements in the national rail system’s safety measures, Argentines have expressed qualms about the security of using such services. For example, a February train crash at the Once Station in Buenos Aires that killed 51 passengers and wounded 700 was a tragedy that many believe could have been avoided had the government taken steps to replace the outdated braking system that proved culpable. Given the rail system’s incessant need of significant updates, Argentines are justified in their frustrations with the country’s political parties’ inaction. Indeed this sentiment has been directed at both the opposition and the ruling party, la Frente para la Victoria (FPV). 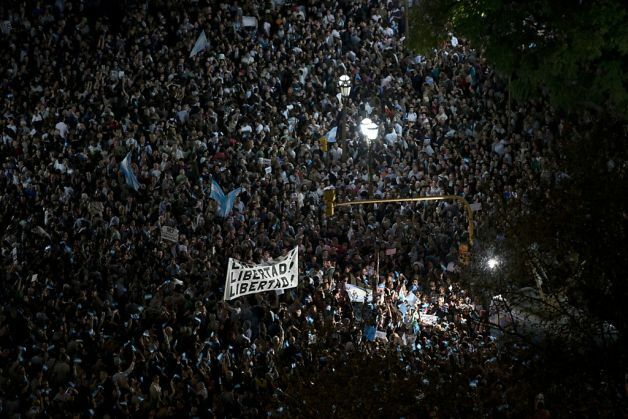 Although the large protests last Thursday night expressed a consistently negative attitude, citizens and expatriates should be encouraged by the latest Argentine demonstration of political freedom throughout the entire country. It is reassuring that Argentine citizens still feel as though they can publicly agree with or speak out against the government, no matter which party is in power. However, the Argentine political elite must realize that if it does not listen to its citizens’ demands and make the appropriate adjustments, the protests and unrest will continue. Associated Press. “Argentina sees largest anti-government protests yet; many disapprove of economic management.” Washington Post. September 13, 2012. http://www.washingtonpost.com/business/argentina-sees-largest-anti-government-protests-yet-many-disapprove-of-economic-management/2012/09/13/c14e07d2-fe11-11e1-98c6-ec0a0a93f8eb_story.html. Accessed September 14, 2012. “‘Seguridad, libertad y justicia’, los principales reclamos de la gente.” Clarín. 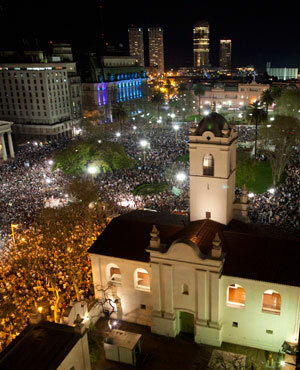 September 14, 2012. http://www.clarin.com/politica/cacerolazo-redes_sociales-movilizacion-Plaza_de_Mayo_0_773322931.html. Accessed September 14, 2012. “Argentina’s dubious poverty line. The six-peso diet: Rumbling stomachs, grumbling citizens.” The Economist. September 8, 2012. http://www.economist.com/node/21562238. Accessed September 14, 2012. “Medio centenar de muertos en un accidente ferroviario en Argentina.” El País. February 22, 2012. http://internacional.elpais.com/internacional/2012/02/22/actualidad/1329921646_764629.html. Accessed September 14, 2012.